Mennonite Central Committee, the joint relief and service agency of nearly all North American Mennonites, was composed in 1957 of representatives of the following seventeen distinct Mennonite bodies or agencies (with years of adherence); viz., Mennonite Church (MC) 1920, General Conference Mennonite 1920, Mennonite Brethren 1920, Lancaster Conference (MC) 1920, Krimmer Mennonite Brethren 1920, Evangelical Mennonite (Defenceless) 1930, Church of God in Christ, Mennonite 1940, Brethren in Christ 1940, Conservative (Amish) Mennonite 1941, Old Order Amish Mennonite 1942, Evangelical Mennonite Brethren 1944, Nonresistant Relief Organization of Ontario 1944, Conference of Historic Peace Churches (Ontario) 1944, Mennonite Central Relief Committee of Western Canada 1944, Canadian Mennonite Relief Committee of Manitoba 1944, Canadian Mennonite Board of Colonization 1944, Beachy Amish Mennonite 1956. Since conferences were entitled to one representative for each 25,000 members or fraction thereof, the first two groups have two representatives each, and since there were two members-at-large, the total MCC membership in 1957 was 20. In addition there were three associate members, United Missionary Church (Indiana Conference) since 1930, the Missionary Church Association since 1940, and the Emmanuel Mennonite Church at Meade, Kansas, since 1952. At the beginning, in 1920, two additional groups were represented, the Central Conference (merged in 1947 with the General Conference Mennonite group) and the Pacific Branch of the Relief Committee for the Suffering Mennonites of Russia (discontinued about 1925). The MCC was incorporated at Lancaster, Pennsylvania on 27 August 1937; before this it had no constitution or bylaws, operating solely on the basis of the authorizing resolution of 27 July 1920, which date may be considered as its date of origin at Elkhart. Mennonite Central Committee Executive Committee, 1951. Back row (L-R): H. A. Fast, C. F. Klassen, H. S. Bender, and C. N. Hostetter. Front row (L-R): O. O. Miller, P. C. Hiebert, and J. J. Thiessen. The committee, which met annually, operated through an executive committee elected by its annual meeting, at first composed of the three officers, enlarged in 1930 to four, in 1944 to five, in 1948 to six, which met as frequently as necessary, averaging six meetings per year. The direct administration of all MCC work was through an executive secretary, who was Levi Mumaw at Scottdale, 1920-1935, and then Orie O. Miller at Akron, near Lancaster, Pennsylvania, 1935-1957. Since 1935 the executive headquarters has been at Akron, where the MCC in 1957 owned six office and residential buildings and employed an average staff of fifty. In addition the following regional offices were maintained with a total staff of ten: Waterloo, Ontario, Newton, Kansas, Reedley, California, each with a clothing and food center, besides the clothing and food center at Ephrata, Pennsylvania. Foreign centers, with owned or leased buildings, were maintained at Sao Paulo, Brazil; Montevideo, Uruguay (owned); Asuncion, Paraguay (owned); Kaiserslautern, Germany (owned); Frankfurt, Germany; Amsterdam, Holland; and Basel, Switzerland. The Ailsa Craig (Ontario) Boys Home was also owned property (since 1955). Three mental hospitals were owned and operated through an incorporated agency (Mennonite Mental Health Services): Brook Lane Farm near Hagerstown, MD, Kings View Homes at Reedley, California and Prairie View Mental Hospital at Newton, Kansas. The MCC also still owned considerable holdings (some 200,000 acres) near the Mennonite settlements in the Paraguayan Chaco through its purchase of Corporación Paraguaya in 1937. The total net dollar assets of the MCC in 1957 were $1,900,000. Long-time office members and staff workers of the MCC have been P. C. Hiebert, chairman 1920-1954, chairman emeritus 1954- ; O. O. Miller, member 1921- , executive secretary 1935-1957; Levi Mumaw, executive secretary 1920-1935; M. H. Kratz, vice-chairman 1920-1939; H. S. Bender, assistant secretary 1930- ; H. A. Fast, vice-chairman 1943- ; C. F. Klassen, executive committee member 1944-1954; J. J. Thiessen, executive committee member 1948- ; Allen Yoder, executive committee member 1920-1930, 1934-1944; D. M. Hofer, member 1920-44; John H. Mellinger, member 1920-36; H. F. Garber, member 1936-56; J. B. Martin, member 1944- ; J. N. Byler, director of relief 1945- ; William T. Snyder, director of Mennonite Aid 1945- , executive committee member 1954- ; J. Harold Sherk, executive secretary of the Peace Section 1949- ; Delmar Stahly, director of Mental Health Services 1949- . In 1957 the MCC had worker teams in Holland, Germany, France, Austria, Switzerland, Greece, Jordan, Indonesia, India and Nepal, South Vietnam, Korea, Japan, Argentina, Paraguay, Uruguay, and Brazil. The Latin America projects were all in connection with the Mennonite refugee settlements made there in 1930 and since. Discontinued fields of service were England, Egypt, Italy, Hungary, Poland, Denmark, China, Formosa, Philippines, Puerto Rico, and Mexico. 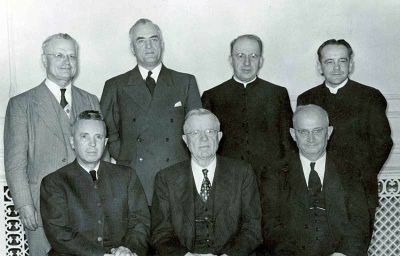 Two departments of MCC service were organized as sections with membership bodies: the Peace Section (1947), successor to the Mennonite Central Peace Committee (1939), of which H. S. Bender had been the continuous chairman, and the Mennonite Aid Section (1943), of which J. Winfield Fretz had been the continuous chairman. Other important departments were Mennonite Mental Health Services, Inc. (1946 first form of organization), of which H. A. Fast was chairman to 1957; the Voluntary Service Office (1946) and the I-W Services Office (1952). The latter two were merged into one department in 1955. The Mennonite Resettlement Finance, Inc., a holding agency for certain Paraguay financing, was in existence 1948-1955. Menno Travel Service, Inc., was set up as a subsidiary travel agency in 1947. It maintained a main office at Akron, subsidiary offices at Goshen, Newton, and in Europe at Amsterdam. The MCC was originally created in July 1920 to operate a joint Mennonite famine relief program in Russia, requested by the several Mennonite relief committees of North America at that time engaged in sending aid to Mennonites in Russia. The Mennonite Studienkommission of four delegates from Russia, who were at that time visiting the United States and Canada, had strongly urged such a united organization. Upon completion of the active program in Russia (1920-1925) the Committee intended to disband but did not formally do so. It was reactivated by the emergency of 1929-1930 when the call came to aid several thousand Mennonite refugees who had come out of Russia into Germany October to November 1929. Its second task therefore was the resettlement of many of these refugees in Paraguay in 1930, since when it continuously aided the colonies there, especially the Fernheim, Neuland, and Volendam colonies, which it originally sponsored. The third field of service was War Sufferers Relief during and following World War II, beginning in Poland in September 1939. The total program finally included work in twelve western and central European countries, including Egypt. This program was chiefly the distribution of food and clothing, and included community services and peace testimony. At the peak of the work (summer of 1947) 317 workers were simultaneously in service in Europe. The program in Jordan for Arab refugees was begun in 1950. The work in the Far East, with programs in eight countries, was begun with war emergency relief services in Bengal, India (creation of the inter-Mission organization Mennonite Relief Committee in India, MRCI), and entrance into China in 1945. Puerto Rico work began in 1943 in connection with Civilian Public Service. In all areas where Mennonite churches were located, especially in Europe, the MCC work led to close and fruitful interaction between North American and local Mennonites. Out of this interaction came among other things a monthly publication, Der Mennonit, published by the MCC at Basel in 1948-1956 and later at Frankfurt (continued by a European Board), the European Mennonite Bible School at Basel (est. 1950) under an international Mennonite board, Mennonite Voluntary Service in Europe (1950) under a European Mennonite committee, the International Mennonite Peace Committee (1947), and the Christian Education Materials Project (CEMO) at Basel (1952). The war emergency relief needs in Europe had almost disappeared by 1957, so that the continuing MCC program in Europe was greatly reduced though still continuing in certain special services and in contact with European Mennonites. The relief program in the Far East (Korea, Indonesia, and South Vietnam in particular) was also reduced, but not so greatly as in Europe. In the course of its relief effort the MCC became a member of the following inter-group relief organizations sponsored by the United States State Department: American Council of Voluntary Agencies (1944), Council of Relief Agencies Licensed for Operation in Germany (CRALOG, 1946), Licensed Agency for Relief in Asia (LARA, 1947), and Co-operative for American Remittances to Europe (CARE, 1945). The fourth major field of MCC service was the operation of Civilian Public Service assumed in 1941. At this time the MCC also became a member of the National Service Board for Religious Objectors (NSBRO). The fifth field of service was the resettlement of Russian and Danzig Mennonite refugees after World War II, the former in Paraguay (4,849 persons in 1947-1952) and the latter in Uruguay (1,184 persons 1948-1952). Voluntary Service for young Mennonite in North America was begun in 1945 as the sixth field of service. The seventh field was that of Mental Health Service, begun in 1949 with the establishment of the mental hospital Brook Lane Farm at Leitersburg, MD. The eighth program was one of aid to the Old Colony Mennonites in Mexico (1950-1956). The ninth and last new field was the I-W Service Program begun in 1952 with the renewal of the United States draft of conscientious objectors in that year, which had been suspended 1947-1952. In the course of its various activities the MCC has issued numerous publications—periodicals, books, and pamphlets. Some of the periodicals have been the monthly MCC Services Bulletin (1945- ), the monthly I-W Mirror 1953- ), and various area relief newsletters such as monthly European Relief Notes 1945- ), the monthly Der Mennonit (1948-56), and the biweekly Unser Blatt (1947-50) at Gronau, Germany. The pamphlets and booklets issued have included a group of titles published by the Peace Section, another group by the Mennonite Aid Section, and the CPS "Core Course Booklets," and some individual titles. Melvin Gingerich, What of Noncombatant Service (1949). J. W. Fretz, Christian Mutual Aid (1947). No. 6, P. C. Hiebert, Life and Service in the Kingdom of God. A Ministry of Goodwill, An Account of Mennonite Relief Work Following World War II (1950). The official MCC handbook appeared first in 1943 and 1945 as Handbook of Information on the Mennonite Central Committee, then under the title Handbook of the Mennonite Central Committee in editions of 1950 and 1954. The size of MCC operations at the heights of its program may be indicated in part by a summary of the income during the five years 1 December 1947, to 30 November 1952: total income $9,239,601.73; War Sufferers Relief cash $2,008,276.24; War Sufferers Material Aid $5,242,153.33; Mennonite Aid $1,472,636.39; Mental Health $207,588.92; Voluntary Service $136,303.29; Peace Section $79,305.24. The following statements taken from the MCC Handbook (pp. 7-8, and 27-29) and prepared by Irvin Horst upon the basis of statements adopted at various times by the MCC and constituent bodies indicate the foundation of faith and commitment upon which the work of the MCC was established and continued. "In a very real sense the MCC is an organization which spontaneously grew out of the desire of the Mennonite brotherhood to feed the hungry, clothe the naked, and to testify by loving service to the Gospel of peace and love. This desire to respond with a witness of Christian peace and love grew in vision and compulsion as various emergencies were faced both within and without the brotherhood. Relief and peace services were an integral part of the Mennonite witness and way of life in the world. Where the various Mennonite and Brethren in Christ bodies retained their faith and ideals they were moved to remain firm in the position of nonresistance and to be energetic in showing mercy and love toward enemies as well as toward all mankind. To implement these compulsions they desired an organization to provide a channel for sharing their gifts and services 'In the Name of Christ.' "
"The experiences of relief and peace work during the past thirty-six years have indicated the wisdom of organizing a common agency to meet common emergencies and tasks, particularly when such emergencies were greater than any one group could have well performed alone. Through a common witness the various groups were able to speak as one voice against war and militarism; through a common representation the various bodies were able to reach and assist, as in no other way, the Mennonites in Russia, Holland, France, Germany, Switzerland, Brazil, Paraguay, Uruguay. What little the Mennonites of North America with their slender resources have been able to do for a suffering world was multiplied in effectiveness by co-operative administration of these resources, whether it was in Russia, France, India, China, or any of the other countries in which relief and peace services were expended. "The Mennonite position regarding relief and service is a part of the particular Christian faith and way of life which has its background and origin in the Anabaptist movement of Reformation times. This movement, as others before and after, under the providence of God was a fresh and vital discovery of the living truth and spirit of the New Testament. The experience was so compellingly real that it sought an uncompromising fulfillment of the Gospel in life; it was so powerful that it survived the most obliterating persecution, to persist down to our own times. This heritage, in so far as it still lives in the Mennonite bodies of North America, motivates and guides the service program of the Mennonite Central Committee. Its principles, if accepted and put into practice, become for us in our own time, we believe, a unique experience of fellowship with Christ in loving discipleship and service to others. The Central Position and Authority of Christ and the Bible. While recognizing the hand of God in history and the voice of the Holy Spirit in the experiences of the church and individual Christians, we accept the Bible, particularly the New Testament, as the final authority for faith and action. Relief and service have validity for us only as the motivation, spirit, and methods of work are in keeping with the Bible. We advocate voluntary and sacrificial service because it is enjoined by Christ and the apostles. We have confidence in the Bible as a guide to a realistic understanding of the place and work of the Christian in the world. While recognizing the tools of human training and learning, we believe the Bible is a reference to eternal truth which transcends all indefiniteness and obscurity of human thinking. 'If you seek God with all your heart and would not be deceived, do not depend upon men and the doctrine of men, however old, holy and excellent they may be esteemed, for one theologian is against the other, both in ancient and modern times; but build upon Christ and His Word alone, upon the sure teaching and practice of His holy apostles . . (Menno Simons). The Christian Life as Discipleship. The Christian life is a transformed life, separated from sin and the world and consecrated to good works in imitation of Christ. `And he that taketh not his cross, and followeth after me, is not worthy of me. He that findeth his life shall lose it; and he that loseth his life for my sake shall find it' (Matthew 10:38, 39). The inner experience will result in outward expression. Christians not only hear but are also 'doers of the word.' Christian discipleship signifies the total devotion of one's life and possessions to kingdom service. We believe that discipleship includes the welfare of the brotherhood, but more especially an unlimited response and continual outreach to the needs of all mankind, both spiritual and material. 'Even as the Son of man came not to be ministered unto, but to minister, and to give his life a ransom for many' (Matthew 20:28). As disciples of Christ we desire to be more conscious of His leading than the number of persons helped, the total tons of clothing distributed, and whether or not our services are recognized and commended by the world. We are convinced that God leads us forth into the needs of the world at all times with all our resources, but at the same time we know that evil will continue in the world and that we dare not be frustrated or relinquish our services when at times it seems to triumph. Relief and Service, A Christian Witness. As a part of the life and outreach of the Christian brotherhood, relief and service can be a testimony to the redemptive and reconciling power of the Gospel. Because of this conviction, we are concerned about the Christian faith and character of worker personnel. We are equally concerned that the spirit and methods of service and distribution be Christian, that is, that they are spiritual, sympathetic, merciful, without discrimination and without prejudice. This concern also causes us to use Christian insignia and to speak frequently of the motto, 'In the Name of Christ.' In contrast to some other types of relief, we believe it is important that our own workers be present on the field and represented at distributions. Mennonite relief seeks to be humanitarian plus a Christian witness. Mennonite relief, however, is not mission work in the sense of organized, direct evangelistic appeal to man's spiritual need, but rather in the sense that all of the Christian's life and action is a witness to the Gospel. 'Let your light so shine before men, that they may see your good works, and glorify your Father which is in heaven' (Matthew 5:16). The Emphasis on Christian Love and Nonresistance. In common with various other Christian groups, Mennonites share the conviction that Christian love and nonresistance are applicable to all human relationships. This conviction finds its basis in the teaching and example of Christ and the apostles (Matthew 5:38-48; Romans 12:17-21). Hate and violence, whether on the personal or national level, are the antithesis of Christ and the Gospel Relief and service are ways of affirming our good faith in the doctrine of nonresistance in that they provide positive, creative expression of peace and good will. Relief and service are not only a witness to the way of Christian love but they can become a method of overcoming evil, of reconciling an enemy. 'Therefore if thine enemy hunger, feed him; if he thirst, give him drink; for in so doing thou shalt heap coals of fire on his head. Be not overcome of evil, but overcome evil with good' (Romans 12:20, 21). Real nonresistance, however, is far more than an intellectual concept or even a doctrinal belief to be proved by Scriptural texts; it is part of a way of life which spontaneously reflects the presence of the indwelling Christ. On the relief field and in service projects love and nonresistance often lead to a special concern for despised minorities, neglected persons, prisoners, political outcasts. 'Inasmuch as ye have done it unto one of the least of these my brethren, ye have done it unto me' (Matthew 25:40). In August 1985 Robert Burkholder, who was living and working with his wife Jill and their four boys in southern Lebanon, was picked up one morning at their home in Nabatiya by a group of armed men. He was taken to Beirut for interrogation to find out what he was doing as a foreigner in war-torn southern Lebanon. Late that same evening he was released, too late to return home. When he did return to his wife and children in Nabatiya the next day, representatives from all the local fighting factions were there to greet him and welcome him back. At the annual MCC meeting in January 1985, there was intense discussion about MCC personnel in El Salvador who worked in contested areas as well as in areas controlled by the government. In May of that year Blake Ortman and Susan Klassen, along with a Salvadoran Catholic health worker, were picked up by the military in Cacaopera, a town in the northern transitional area periodically visited by both the army and the "guerrillas." They were taken to the regional army headquarters and eventually to the capital city, San Salvador, for interrogation. They were accused of teaching Marxism and of associating with the "guerrillas." Eventually they were released. In July 1987 residents of the coastal town of Homoine in northeast Mozambique were massacred by anti-government bandits who killed 424 people in their attack and took another 298 persons, including some infants, as captives. The massacre was witnessed by MCC worker Mark Van Koevering, an agronomist working with the Christian Council of Mozambique, who was in Homoine during the attack. Van Koevering reported that the farmers he worked with were often too terrorized to sleep in their homes, but rather took refuge in fields and irrigation ditches. The massacre created uncertainties about Van Koevering's own return to Homoine, but after consultation and prayer with his African and MCC colleagues, it was decided to support Mark in his return to Homoine. "As a member of the Christian Council of Mozambique," he said, "I represent the Christian church of Mozambique, and in a very concrete way the Christian church worldwide. I am returning to Homoine for only one reason, because we are Christians called by God to serve him and his people. Our action in Homoine is being watched by the government and I believe it will be a powerful witness in the community." The Mennonite Central Committee is known as the cooperative relief, service, and development agency of North American Mennonite and Brethren in Christ churches. The MCC is a Christian resource for meeting human need. In his article on the MCC above, Harold S. Bender, longtime MCC assistant secretary, traced the development of the Mennonite Central Committee from its origins in 1920, noting the following nine program developments: (1) the original joint Mennonite Famine Relief Program in Russia; (2) the resettlement of Russian Mennonite refugees from Europe to Paraguay in 1930; (3) the War Sufferer's Relief Program during and following World War II in Europe beginning in 1939; (4) the operation of the Civilian Public Service Program in the United States, 1941ff. ; (5) the resettlement of Russian and Danzig Mennonite refugees after World War II in Paraguay and Uruguay; (6) development of the °Voluntary Service program for young Mennonites in North America beginning in 1945; (7) development of the Mennonite Mental Health Services Program with establishment of the first mental hospital at Brooklane Farm in Maryland; (8) aid to the Old Colony Mennonites in Mexico from 1950 to 1956; and (9) development of the I-W alternative service program as a military service alternative beginning in 1952. Since those earlier beginnings the Mennonite Central Committee has grown into the largest inter-Mennonite organization in the world with a vast variety of organizational relationships and program involvements, from shipping grain provided by the Canadian Food Bank to famine areas in Ethiopia to assistance with the translation and production of Bible commentaries for Christians in the Soviet Union. For many persons in the Mennonite constituencies the worldwide programs of the Mennonite Central Committee have come to symbolize what it means to be an Anabaptist Christian in today's world. In 1987 the Mennonite Central Committee had more than 1,000 workers serving two- to three-year assignments in some 50 countries, including volunteers and staff in North America. Many times that number served as short or long-term local volunteers —an estimated 5,000 served as volunteers in the 130 MCC SELFHELP Crafts and Thrift Shops (now Ten Thousand Villages) in Canada and the United States. Roughly three-fourths of the long-term staff and two- to three-year volunteers were from MCC constituent groups (Mennonite and Brethren in Christ), and the other one-fourth from a variety of non-Mennonite groups. The largest number of volunteers were in the developing countries of Asia, Africa, and Latin America, and in Canada and the United States. Assignments included agricultural development, water conservation, health education, participation in village health teams, formal and informal education, economic and technical projects, church-related programs, social services, East-West dialogue, and peacemaking. The majority of MCCers worked in long-range development activities. Strengthening the work of local churches and community groups was a priority. Wherever possible volunteers worked closely with local churches as well as with Mennonite and other mission agencies. Volunteers also provided food and other emergency services to people caught in drought, famine, and warfare. The supporting churches in North America provided the MCC with material aid to help meet the immediate needs of people throughout the world. Mennonites and Brethren in Christ, along with those from other church families, contributed meat (canned in MCC's portable canner), corn, wheat, and beans. They also contributed other gifts in kind, e.g., bedding, clothing, soap, bandages, and school supplies. The MCC (international) budget in the 1980s totaled nearly 30 million dollars annually, roughly 20 million dollars in cash and 10 million dollars in material aid. Of the cash budget, approximately two-thirds came from the constituency. Other sources of support included the contributed earnings of volunteers, SELFHELP crafts, grants from private or Canadian government agencies, and contributions from Mennonite churches abroad. MCC programs included SELFHELP crafts, a job creation program that enabled approximately 30,000 artisans in many developing countries to earn at least part of their own living; the International Visitor Exchange program, which brought international young people to North America for a year to promote better understanding; the Child Sponsorship program which made it possible for North Americans to provide assistance for students to attend schools in various locations around the world; and the MCC Peace Office which served as a resource to the international ministries of the MCC. The Mennonite Central Committee, though involved in a worldwide program, in 1987 was essentially a North American or bi-national organization of Mennonite and Brethren in Christ groups in Canada and the United States. In the United States the MCC representatives were for the most part appointed by the respective Mennonite conferences—Beachy Amish Mennonite, Brethren in Christ, Conservative Mennonite Conference, Emmanuel Mennonite Church (Meade, Kansas, USA), Evangelical Mennonite Conference, General Conference Mennonite Church, Lancaster Conference (MC), Mennonite Brethren, and Mennonite Church (MC). MCC (International) representatives from Canada are selected from the MCC provincial and MCC Canada organizations. The MCC board, which meets annually in January for program review and policy decisions, had 39 members in 1987. The executive committee, which meets four times a year, had six members from Canada and six from the United States. The overseas program administration was centered in the international headquarters offices in Akron, PA, supplemented by overseas services of the MCC Canada. The Mennonite Central Committee Canada offices in Winnipeg, MB, and the Mennonite Central Committee United States offices in Akron, PA, administered North American programs and represented the MCC to its respective constituencies. The provincial and regional offices also served as links from the constituency to the MCC. As the Mennonite Central Committee has grown in scope and complexity, so have the questions and issues related to its identity, its organization, and its programs in the world. As a bi-national organization that does not presume to represent Mennonites and Brethren in Christ from all parts of the world, the MCC nevertheless seeks in a variety of ways to internationalize its staff and program. Examples are the cooperation with the International Mennonite Organization of European Mennonites, cooperation with the mission and service organizations of the Paraguayan Mennonites, and cooperation with various service and development organizations of Mennonites in countries such as India, Democratic Republic of Congo, and Colombia. As the introductory stories from Lebanon, El Salvador, and Mozambique suggest, the workers of the Mennonite Central Committee, seeking faithfulness in meeting human need, have also become more involved in complex issues of war and peace, and of international economics and politics. Throughout its history the MCC has had programs in 84 countries. The development from war sufferers' relief, to a variety of service ministries, to long-range agricultural and economic development, has involved the MCC in issues of oppression and injustice. This has also led to considerable disagreement within the constituency and to some groups distancing themselves from especially those program activities which seem to have political entanglements. Further is the larger and broader emission issue of how Christians, especially Christians from wealthy and politically dominant countries in North America and Europe, should best be present in the world today—in relationships with the poorer peoples of the world and especially also peoples of other cultures, religions, and political commitments. Economic development programs in many parts of the world, especially when unilaterally administered, have fallen into considerable disrepute. Even the traditional Mennonite service stance, when suggesting a paternalistic relationship, is being seriously questioned. In many parts of the world, MCC workers have been emphasizing a "Christian presence" relationship with a strong emphasis on a listening and learning stance, out of which a mutual giving and receiving relationship may develop. See also Disaster Services; Indian Ministries; Mennonite Christian Service Fellowship of India; Relief Sales; Stichting voor Bijzondere Noden. The major MCC newsletters in 1987 were Contact, Intercom, Peace Section Newsletter, Washington Memo, and Food and Hunger Notes. Publications providing additional MCC information are Mennonite Central Committee Workbook, prepared each year for the annual meeting. Erb, Paul. Orie O. Miller: The Story of a Man and an Era. Scottdale, PA: Herald Press, 1969. Hege, Christian and Christian Neff. Mennonitisches Lexikon, 4 vols. Frankfurt & Weierhof: Hege; Karlsruhe: Schneider, 1913-1967: v. III, 97-99. Hiebert, P. C. and Orie O. Miller. Feeding the Hungry: Russian Famine, 1919-1925: American Mennonite Relief Operations under the auspices of Mennonite Centre Committee . Scottdale, PA: Mennonite Central Committee, 1929. Horst, Irvin B. A Ministry of Goodwill—A Short Account of Mennonite Relief 1939-1949. Akron, PA: MCC, 1950. The Mennonite Central Committee Story, vols. 1-5. Scottdale, PA: Herald Press, 1980-1988. Mennonite Quarterly Review 44, no. 3 (July 1970): special Issue. Bender, Harold S. and Elmer Neufeld. "Mennonite Central Committee (International)." Global Anabaptist Mennonite Encyclopedia Online. 1987. Web. 22 Apr 2019. http://gameo.org/index.php?title=Mennonite_Central_Committee_(International)&oldid=145869. Bender, Harold S. and Elmer Neufeld. (1987). Mennonite Central Committee (International). Global Anabaptist Mennonite Encyclopedia Online. Retrieved 22 April 2019, from http://gameo.org/index.php?title=Mennonite_Central_Committee_(International)&oldid=145869. Adapted by permission of Herald Press, Harrisonburg, Virginia, from Mennonite Encyclopedia, Vol. 3, pp. 605-609; vol. 5, pp. 560-562. All rights reserved.